Occupying the crater of an extinct volcano, La Laguna Encantada is a truly beautiful lake, especially near sunrise or sunset. 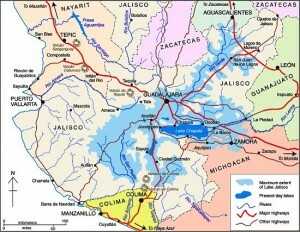 Laguna Encantada is located 3 km northeast of San Andrés Tuxtla. The access road is unpaved. The views are ever-changing on the easy walk of about 1500 meters (slightly under one mile) around its shoreline. As you walk, try counting the butterflies. A study twenty years ago recorded a staggering total of 182 different species in this relatively small area of jungle. Only a few kilometers from Laguna Encantada is another wonderful natural sight: the Eyipantla Waterfall (Salto de Eyipantla). The water for the falls comes from the Comoapan river, which drains Lake Catemaco. After heavy rain, the curtain of water at Eyipantla is about 50 meters high and 20 meters wide. The sunlight playing on the water creates a dazzling display of magical colors. 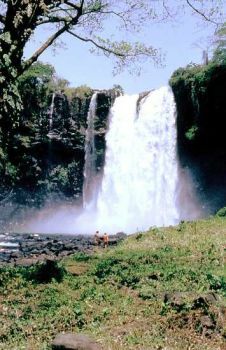 The Tuxtlas region has been the setting for numerous movies and commercials and the impressive Eyipantla Falls have starred in many of them. The unusual name, Eyipantla, reflects its three chutes of water, and is derived from the Nahuátl words, eyi (three), pantli (trench) and tla (water). 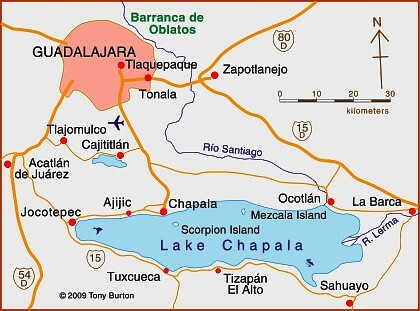 Other Comments Off on How big is Lake Chapala? There is no single answer to this question. It all depends on the reference point in time. In recent history, the size of the Lake has continued to change dramatically. In the 19th century, the Lake stretched almost 20 kilometers farther east. Construction of an 80 kilometer dike and drainage system in 1908 attempted to capture a large portion of the lake for agricultural use. Through a series of successive floods, partially attributed to the Poncitlán Dam on the Rio Santiago, the lake recaptured the land. However, the dikes were re-constructed and the land eventually converted to permanent farmland, only occasionally disrupted by flooding. Environmentalists argue that this has destroyed an important ecological role of this once important marshland. The size of Lake Chapala has fluctuated significantly in recent decades; from extreme lows in 1954-56, 1992 and 2003 to highs in the 1960-70s and 2005-06. These dramatic low to high changes can increase the Lake level by 8 meters, its volume by a whopping 800% and its surface area by 100%. Fortunately, the Lake is at a relatively high level as we approach the 2010 rainy season. Obviously, answering the question, “How big is Lake Chapala?” is very time sensitive. In November 2009, Lake Chapala was about 75 by 25 kilometers with a surface area of 1150 square kilometers and a volume of 5.5 billion cubic meters (bcm). Lake Chapala is sometimes called the largest lake in Mexico, but even this can be questioned. It is the largest in terms of surface area. But with its shallow depth it is not the largest in terms of volume. The amount of water it holds, even when full to maximum capacity, is only 8.1 bcm. 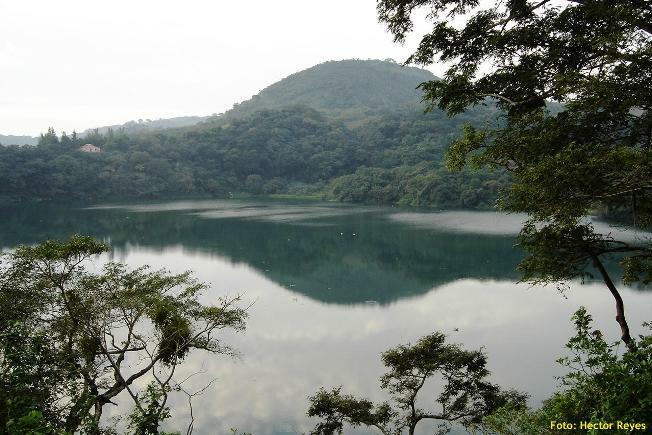 It trails three reservoirs behind hydroelectric dams: La Angostura (10.7 bcm), Malpaso (9.6 bcm) and Infiernillo (9.3 bcm). But we must remember that the volume of all Mexico’s lakes and reservoirs varies enormously from season to season and year to year. What about the future? All lakes are destined to disappear because they all eventually fill completely with sediment. In the not too distant geologic future, Lake Chapala will be gone. Speaking of the future, geologic fault systems aligned with Lake Chapala, working with nearby fault systems, will eventually create a large Pacific island from a big chunk of western Mexico containing Puerto Vallarta and Manzanillo. in Tony Burton’s Lake Chapala Through the Ages, an anthology of travellers’ tales (Sombrero Books, 2008). The first detailed scientific account of Lake Chapala was written by Henri Guillaume Galeotti. It was based on a visit to Chapala in February-March 1837, and published in French in 1839. Galeotti (1814-1858) was born in Paris and studied natural history at the Establissement Géographique de Brussels, founded in 1830 by Philippe Vandermaelen, a very famous Flemish cartographer. Vandermaelen produced an extraordinary world atlas, published in 1827, with 400 maps in six volumes, covering the entire world at a uniform scale of about 1:1,600,000. Galeotti arrived in Mexico in December 1835; it turned out to be a visit which lasted several years. Galeotti was primarily a botanist, and was responsible for the first scientific descriptions of scores of plants, including a wide variety of cacti, for which he had a particularly fondness. All in all, his article is a remarkable achievement for its time, and a true testimony to the powerful pull that Lake Chapala has had on so many foreign visitors. Source: Galeotti, H. G. 1839 Coup d’oeil sur la Laguna de Chapala au Mexique, avec notes géognostiques. Translations by the author; all rights reserved. 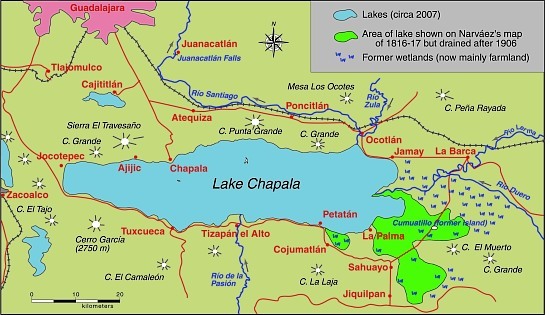 Note: This is an edited version of an article originally published on MexConnect, and based on chapter 21–“The natural history of Lake Chapala”–of Tony Burton’s Lake Chapala Through the Ages, an anthology of travellers’ tales (Sombrero Books, 2008) – click here for the original article. 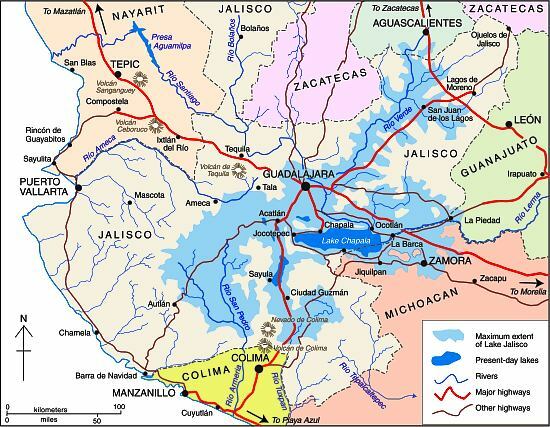 The hydrology of Lake Chapala is discussed in chapters 6 and 7 of Geo-Mexico: the geography and dynamics of modern Mexico. A case study of ‘residential tourism’ in the villages on the northern shore of Lake Chapala is discussed in chapter19 of Geo-Mexico: the geography and dynamics of modern Mexico. The figures show that the lake is still well below its “historic norm” level.